Many developments are taking place in the area of Intelligent Transport Systems (ITS) for traffic purposes. Many of the current ITS applications are mainly aimed at increasing comfort while driving and at improving accessibility. In addition, systems like the alcolock and the seatbelt lock are being developed with the primary aim of road safety. There are also systems, such as Advanced Cruise Control and Dynamic Route Information Panels, that are not specifically intended to improve road safety, but that can have an effect. There are high expectations for the positive effects of ITS applications. Public and political support, a possibly gradual introduction and cooperation between all parties involved are essential for successful implementation. In road traffic extensive use is already being made of modern information and communication technology, both at the roadside and in the vehicle itself. These technologies are generally known as Intelligent Transport Systems (ITS). ITS allow making traffic flexible and dynamic, adjusted to current circumstances. For some time now all kinds of ITS systems have been developed with road safety as their primary purpose. Such systems are mainly aimed at supporting the driver in the driving task, so that fewer errors will be made and certain unsafe behavioural choices will be avoided. These systems are collectively known as Advanced Driver Assistance Systems (ADAS). Many of these ITS applications fit excellently in the Sustainable Safety vision. A number of safety systems have been tested in practice and are, technically speaking, ready to be marketed. Other systems are only available as prototypes or are just a promising concept. It is to be expected that these systems also will gradually become available in the future. This fact sheet presents an overview of the various types of ITS, of their purpose, their functionality, and of their (un)intended road safety effects. The preconditions for successful implementation are discussed briefly and the roles that the various actors can play are considered. This survey is too brief to deal extensively with all developments in this area. It will be limited to short descriptions based on relevant research (Wegman & Arts, 2006; ADVISORS, 2003; ETSC, 1999; European Commission, 2002; OECD, 2003). What types of ITS systems are there? There are many ways to categorize ITS systems. Some of them are discussed below. systems that allow for interaction between individual vehicles and other data sources, such as between vehicles or between vehicle and roadside. The last category is the most 'intelligent' because these applications make it possible to communicate up-to-the-minute situations to an individual driver. This can be information about, for example, weather conditions, temporary speed limits, the exact location of the vehicle, or hazardous situations further along the road. systems that reduce injury severity. This classification needs taking into account that besides its primary purpose (e.g. driving comfort), an application can have positive or negative effects in other areas (e.g. traffic flow or road safety). In addition, it is sometimes possible that a particular safety ITS does not have the desired effect because the driver, deliberately or unconsciously, adapts his/her behaviour (behaviour adaptation). The next two questions sketch a picture of what is already possible now, or will be possible in the near future in relation with ITS systems. This overview is far from complete. The first question goes into systems that are primarily aimed at road safety and the second question discusses systems that are not, but may still have an influence. Which ITS are primarily aimed at road safety? An already well-known example of systems that prevent unsafe traffic participation, is the alcohol interlock. Before drivers can start their car, they first have to take a breath test when an alcohol interock device has been installed. If the BAC is too high (often 0.2 g/l), the car will not start. This system is already being used in various countries, especially for drivers who have been caught while driving under the influence. It has a considerable effect on recidivism. More information can be found in SWOV fact sheet Alcohol Interlock devices. The seatbelt lock is based on the same principle: if the seatbelt is not fastened, the car will not start. Many cars already have a warning system that operates via a small light, an audible signal or a talking computer (see the archived SWOV fact sheet Seatbelt reminders). The seatbelt lock goes one step further by making it impossible to drive without wearing a seatbelt. A seatbelt lock particularly has an effect on the outcome of crashes. The risk of being killed or severely injured is much greater without a seatbelt than when wearing one. Currently, about 95% of drivers and front seat passengers and more than 80% of back seat passengers use their seatbelts in the Netherlands (see the archived SWOV fact sheet Seatbelts and child restraint seats). A step further than the above applications is the smart card, which is a sort of individual starting permit. All sorts of data about the driver's fitness to drive can be stored on a smart card, such as information about the validity of the driving licence (vehicle type, licence suspension) and any restrictions for using the vehicle, for example in case of a graduated driving licence (see the archived SWOV fact sheet Graduated driving licencing). A smart card can also be used to automatically adjust seats, headrests and seatbelts to the biometric characteristics of the driver. In the somewhat more distant future it will be possible to use the smart card to adapt the in-vehicle information to the capacities and limitations of the individual driver, for instance related to visual capacities. 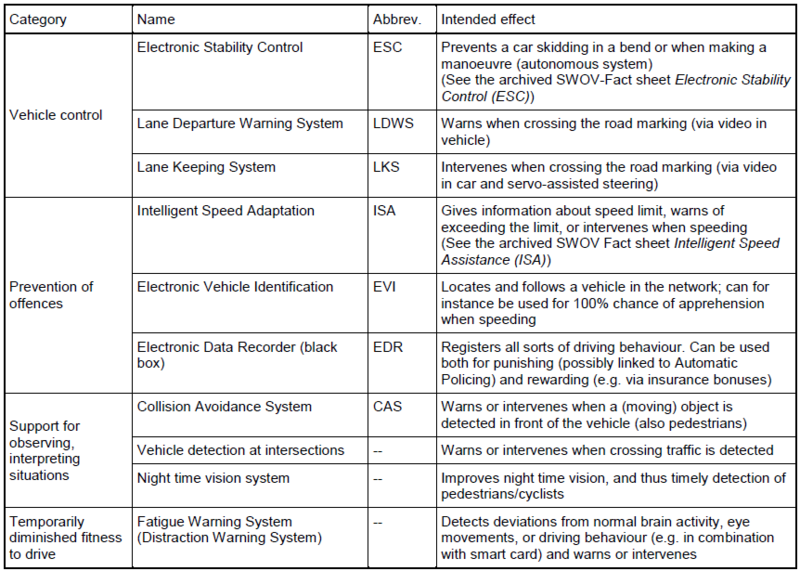 Examples of systems that prevent unsafe situations or actions during traffic participation are systems that offer support for vehicle control, record and/or prevent deliberate and unintentional offences, offer support in observing, interpreting and predicting traffic situations, and react to a (temporarily) reduced fitness to drive. The most well-known systems and their intended effects are grouped together and described in Table 1. Table 1. Systems that prevent unsafe situations or actions while driving. One type of an injury reducing system is the so-called pre-crash sensing system that increases the effectiveness of passive safety instruments like seatbelt or airbag by calculating the collision angle, the collision speed and the size of the collision object just before an unavoidable crash. Furthermore, much European attention goes to eCall, a system that speeds up the arrival of assistance at the crash location by automatically reporting the exact location of a vehicle involved in a crash to the emergency centre. Judging by the types of crashes which these systems are meant to prevent and how often they occur, the conclusion must be that potentially there is much progress to be made. Simulator studies and small-scale field tests of prototypes do indeed show that considerable effects are possible (Wegman & Aarts, 2006; Van Kampen, Krop & Schoon, 2005, Morsink et al., 2008). Generally, systems which actively intervene appear to be more effective than systems which warn, and these systems, in their turn, are more effective than systems which only inform. However, the effect that ultimately will be achieved in practice depends on the precise operation of the systems, their penetration level, and their possible unintended side effects. Diminished attention level. When driving tasks are – partly – replaced by ITS, the driver's attention for the driving task may decrease. Information overload. Road safety will benefit from an as low as possible mental burden on the driver. ITS should not lead to an overload of information. Therefore it is important to give the right information at the right moment, at the right place, for the right duration etc. Incorrect interpretation of information. The driver must be able to understand what the system does and what it wants to do. The wrong interpretation of information can have the opposite effect. Overestimating the system. The driver's expectations of a system must be realistic. The driver must not overestimate the system or rely on it too much. Risk compensation. If a particular measure reduces the risk, some people are inclined to take more risks in another way, resulting in a smaller net effect or, according to some, even reducing it to zero. Effects on non-users. Especially if not all vehicles are equipped with a certain ITS system, it is possible that some drivers without such a system anticipate the supposed behaviour of cars that do have that system. It is also possible that car drivers without such a system would behave as if they did have one (by mistake or imitation). It is therefore important to also test ITS for possible unintended side effects. This is not always easy, because often only prototypes are available at the time of testing. This means that the effects of partial or complete implementation in practice can only be indirectly determined. In further developments much attention will clearly be needed for human-machine interfacing (HMI) and good attuning to other measures, like education. Which other ITS systems can have road safety consequences? Many ITS applications are not in the first place designed for road safety purposes, but for driving comfort or traffic management purposes. Yet, these systems often also have a road safety effect. An example of a system which is mainly being sold as a system to increase driving comfort, is Advanced Cruise Control (ACC; see the archived SWOV Fact sheet Advanced Cruise Control (ACC)). With this system the desired cruising speed and headway time can be set manually. Unlike the conventional cruise control, ACC reacts if the vehicle gets too close to the vehicle in front, either by warning the driver or by automatically reducing speed. However, ACC also affects road safety, both positively and negatively (Hoetink, 2003). Positive effects are mainly to be expected on main roads outside rush hours and under good weather conditions and with good visibility. Under those conditions ACC, among other things, results in a lower average driving speed and in fewer very short headway distances. Use of ACC is ill-advised in busy traffic on motorways and on lower order roads where overtaking is permitted, and if there are many intersections and bends. In addition, there are indications that ACC systems that actively intervene, result in faster speeds and shorter headway times, whereas the non-intervening systems result in slower speeds and longer headway times (Dragutinovic et al., 2005). Well known examples of traffic management systems are the Dynamic Route Information Panels (DRIPs) which give information about congestion on certain road segments and, at the individual vehicle level, the navigation systems which give information about the route to a particular destination. It is to be expected that navigation systems will have a positive road safety effect because they prevent indecisive driving behaviour and signpost searching. This also results in fewer kilometres driven. It is of course important that the information is offered in the appropriate, auditory way, and that the system is not manually operated while driving. The system will then in fact distract from the driving task. It is not known whether navigation systems can also be bad for road safety because drivers 'blindly' follow the indications. Navigation systems could also be explicitly used for road safety purposes by leading drivers along the safest route. Ideally, a road network should be designed in such a way that the shortest route is also the safest route (see also the archived SWOV Fact sheet Safety effects of navigation systems). The scarce information about road safety side effects of DRIPs shows both positive effects (slower and more homogenous speeds; Goudappel Coffeng, 1999; 2001) as well as negative effects (moving traffic to the lower order road network; AGV & Arane, 2004). Information about their road safety effects should be taken into consideration for systems that are meant to spread the traffic in time and space in an efficient way in order to lessen congestion (for example road pricing or congestion charging (Eenink et al., 2007). All in all, it is necessary to also test the safety effects of those ITS systems that are not primarily aimed at road safety. Where possible, we should actively search for possibilities of including safety issues as an explicit part of the application. Until now this has only happened sporadically. At present the implementation of ITS applications is mainly determined by what is technically possible and whether there is a demand for it. Explicit policy is necessary for a good integration of ITS with existing measures in order to meet the high expectations. A prerequisite is political acceptance, which is often motivated by (supposed) public support. This acceptance is still limited, particularly for systems that actively intervene and thus limit the individual motorist's freedom of choice. What could help to gradually increase acceptance is a step-by-step approach beginning with the information-only system, followed by a warning system and only later introducing an actively intervening system. For example, this is very well possible for the Intelligent Speed Assistant (ISA) which is one of the most promising ITS applications and can be introduced in the near future. Furthermore, some technical and legal aspects need attention, such as the systems being fraud proof, system safety, standardization and liability in case of dysfunction. Indispensable for achieving the potential effects in practice is the cooperation of all parties involved (governments, industry, knowledge institutes and interest groups), both national and international. ITS applications for traffic are in full development. There are high expectations of their road safety effects. However, as yet there is insufficient empirical data to make correct quantitative statements about the effects of large scale implementation. In general, however, theoretical analyses, simulation studies and small-scale practical tests confirm that the effects can be substantial. The possible unintended side effects of the applications should also be examined. Furthermore it is important for road safety to also study the possible road safety effects of the ITS applications which do not primarily aim at road safety. A continuous collective effort from all parties involved is essential if the development and implementation of ITS are to stay on the right course. AGV & Arane (2004). Evaluatie stedelijke DRIPs; Eindrapport. Bureau AGV Adviseurs in mobiliteit & Arane, adviseurs in verkeer en vervoer. Gemeente Rotterdam, Rotterdam. ADVISORS (2003). Advanced Driver Assistance and Vehicle Control System Implementations, Standardisation, Optimum Use of the Road Network and Safety. Final report. Commission of the European Communities, Brussels. Christoph, M.W.T. (2010). Schatting van verkeersveiligheidseffecten van intelligente voertuigsystemen. R-2010-8 SWOV, Leidschendam. Dragutinovic, N., Brookhuis, K.A., Hagenzieker, M.P. & Marchau, V.A.W.J. (2005). Behavioural effects of Advanced Cruise Control use; A meta-analytic approach. In: European Journal of Transport and Infrastructure Research, vol. 5, nr. 4, p. 267-280. Eenink, R.G., Dijkstra, A., Wijnen, W. & Janssen, S.T.M.C. (2007). Beprijzen en verkeersveiligheid; Mogelijke effecten van 23 varianten van beprijzen op de verkeersveiligheid. R-2007-4N. SWOV, Leidschendam. ETSC (1999). Intelligent transport systems and road safety. European Transport Safety Council ETSC, Brussels. European Commission (2002). eSafety. Final report of the eSafety Working Group on Road Safety. European Commission, Brussels. Goudappel Coffeng (1999). Evaluatie RIA fase 4; Samenvattend eindrapport. Goudappel Coffeng, Deventer. Goudappel Coffeng (2001). Evaluatie DRIPs Breda; eindrapport. Goudappel Coffeng, Deventer. Hoetink, A.E. (2003). Advanced Cruise Control en verkeersveiligheid; Een literatuurstudie. R-2003-24. SWOV, Leidschendam. Kampen, L.T.B. van, Krop, W.R.M. & Schoon, C.C. (2005). Auto's om veilig mee thuis te komen; de prestaties van de personenauto op het gebied van de voertuigveiligheid in de afgelopen decennia, en een blik vooruit. SWOV, Leidschendam. Malone, K., et al. (2008). Socio-economic impact assessment of stand-alone and co-operative Intelligent Vehicle Safety Systems (IVSS) in Europe; Final report and integration of results and perspectives for market introduction of IVSS. Deliverable D10 (incl. D9). eIMPACT Consortium. European Commission, Brussels. Morsink, P., Goldenbeld, Ch., Dragutinovic, N., Marchau, V., Walta, L. & Brookhuis, K. (2008). Speed support through the intelligent vehicle; Perspective, estimated effects and implementation aspects. R‑2006‑25. SWOV. Leidschendam. OECD (2003). Road Safety; Impact of new technologies. Organisation for Economic Co-operation and Development OECD, Paris. SWOV (2010). Intelligent Transportsystems (ITS) and road safety. SWOV Fact sheet, July 2010. SWOV, Leidschendam.